Wooden frame houses which we offer, are prefabricated in our plant, and installed on site. They have won recognition and have performed well for generations in almost every latitude. – with a special inner climate-friendly wood and natural materials, –aesthetic and with various possibilities to finish the façade. For the construction of our houses we use certified structural wood, dried to a moisture of 15% ( -3%), planed on four sides, and the remaining building materials exclusively of good quality,certified by necessary documents. installation of windowsills ext., int. In the walls channels (conduits) are mounted to rough-in electrical installation and openings for socket outlets and switches. 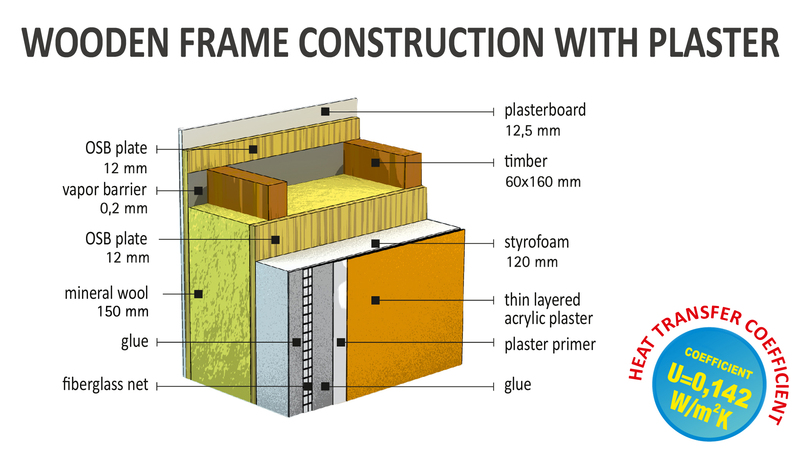 Gypsum plasterboards are mounted on the walls of attics and insulated floor slab (slants). On the building we make a complete roof with wooden soffits, roof covering and drainage (gutters and downpipes). The uniqueness of houses makes that the price is calculated individually depending on your choice of project, scope of works and materials selected for implementation (eg. windows, tile, type of insulation …). Our staff will answer and of your questions knowledgeably. W shall make the appraisal of project indicated by you at your request.